Twice Condemned – Irish views of the Dreyfus affair. Richard Barrett. Original Writing 2011. pp 104. This review was written on July 1st 2011. Alfred Dreyfus, a member of a wealthy Jewish family in France, was a captain in the French artillery. He was accused of spying for the Germans and condemned as a traitor and to life imprisonment in French Guinea in 1894. Almost certainly the evidence against him was far from convincing and the charges against him were vigorously denied by him. 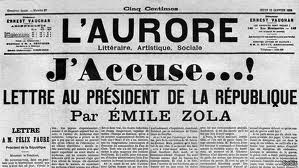 However, his fate was to become a matter of French and world importance after Emil Zola’s "explosive" accusation in early 1898 of military corruption and the wrongful arrest and imprisonment of Dreyfus. Zola’s intervention was to lead him into trouble with the French authorities but it led to a second enquiry into the charge of spying. This second enquiry still confirmed his guilt by a thin majority of 3 to 2 but his sentence was reduced on the grounds of "extenuating circumstances". He was pardoned in 1899, five years after his arrest, but was not officially exonerated by the French government until 1906 after another seven years. Barrett’s short book covers more than the Irish views of the Dreyfus affair. He included the attitudes of the media in Britain, Ireland, the United States and the Commonwealth countries not to mention a few others. The British view of the affair was devastatingly critical of the French and of the increasing anti-Jewish attitude of the many French and particularly of the Roman Catholic Church authorities in that country. The British view was closely mirrored by Protestants and the Protestant media in Ireland and in other countries abroad. The Catholic authorities were defensive of the French decision on Dreyfus and they were motivated to some extent by the then prevailing anti-Jewish attitudes of some of their adherents. The Catholic attitudes in Ireland were mixed in their opinions and were undoubtedly influenced by their nationalistic aspirations and the anti-British attitudes which were widely prevalent in Ireland at the turn of the century. Apart from the genuine criticism of the justification of the arrest and imprisonment of Dreyfus, it is clear that media opinion in other countries, including particularly Britain and Ireland, were based on nationalist prejudices, general attitudes to France and its politics, anti-Semitism and the religious persuasion of the writers. 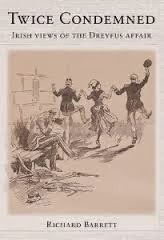 As Barrett says "In England, the reaction ---- had always been more anti-French than pro-Dreyfus" and "in nationalist Ireland, the reaction had always been more anti-British than anti-Dreyfus". And the prevailing anti-Jewish prejudices in France must have contributed much of the genuine differences among the French themselves. 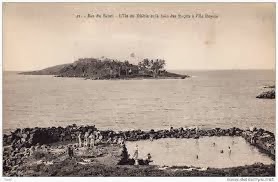 A view of Devil's Island where Dreyfus was held. To me the whole affair was a telling example of the fundamental differences which govern public opinion at an international level and which are inspired to such an extent by local social, religious and political circumstances and prejudices. 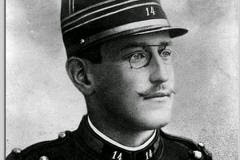 After he was pardoned, Dreyfus rejoined the French army, fought in the Great War and died in 1935.